Those of you who know me aren’t surprised. Yes. I’m geeky about technology. Love it. So when I found an application for my iPad that would allow me to easily create WordPress.com posts AND insert photos from my camera I was excited! I’m testing this today to see how it works. Seems easy enough and not complicated. For my other techno geek friends, here’s the setup: one iPad (mine is first generation but I’d have to assume it will work with the iPad 2 also), one Eye-Fi wireless sd card for my cannon s95 camera, Eye-Fi iPad application, an iPad application called Blogsy, and a Flicker account. Essentially it works like this: stream pictures from your camera to Flicker via the iPad (alternatively you could upload straight to the iPad but that takes up space!). Then use the Blogsy application on the iPad to write the story and a neat little feature in Blogsy that ties you to your Flicker account….this allows you to easily pick a photo and insert it. Oh and you will need internet access through the iPad or wireless. Hit publish and you are done. This post is my first test. 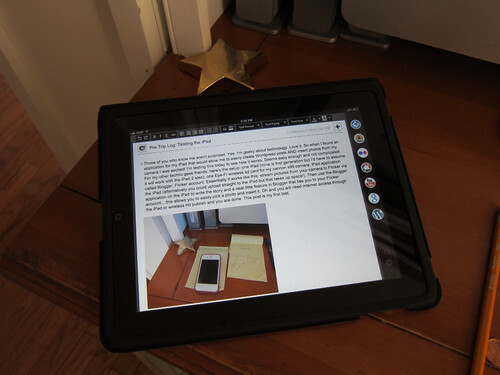 I love your posting about blogging with the iPad. In April we are leaving for France and Spain. I have followed your suggestions for: blogsy and wordpress. What I’m wondering is: do you have a plan for accessing wifi to actually publish your blog postings? Wifi may not be an issue where you are going but I know it definitely is in Spain. And I’m so new to blogsy and the rest of it that I’m wondering do you plan on blogging offline and then send when you are able to or is that possible? Thanks for your comments! In addition to blogsy and wordpress you will also need an Eye-Fi card in your camera and the associated iPad application for Eye-Fi. As for my trip to Italy, I plan to purchase a micro-sim card for my 3g iPad at a Vodafone or Tim store once I arrive. I believe there is a Vodafone store in the Rome airport – and since I have a 5 hour layover I plan to us that time to purchase the micro-sim and get things set up. You can purchase the wireless service on a monthly rate, depending upon how much data you want to purchase. They can help set it up at the wireless store. I’d have to assume that Spain has local carriers that offer micro-sim cards by the month. As for blogging offline, I would have to assume that this is possible, but you might want to check in with the Blogsy folks at http://blogsyapp.com – they are extremely helpful. Good luck with things and have a great trip!